There is magic in poetry and in stories, the way they can inspire people to reach towards impossible goals. Music has its own brand of magic, the manner in which it can mix a mere twelve notes and create pure emotion, talking to the heart and mind without need of words. Such is the magic of the bard, a singer of songs and teller of tales, a jack of all trades who finds his knowledge and power not in the dusty halls of a library or the obscure heritage of a strange bloodline, but in the whim of inspiration and the freedom of the roads. The diversity with which he approaches life makes him capable of tackling almost any situation, not as well as a specialist but with sufficient expertise to come out on top. 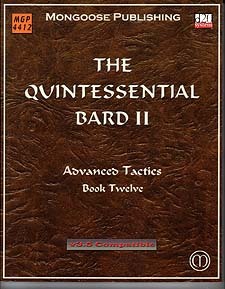 With the help of this sourcebook, any character choosing the bard class will find many alternatives and options for expanding his range of abilities. With Career Paths, bards can customise their advancement with their chosen branch of training. The Legendary Bard offers an expansion of character features that elevate the bard to epic levels and beyond. Multiclassing gives advice on how best to integrate two classes, while Superior Tools ensure that his perforamnce is unparalleled. The Magical Bard offers a new range of magical items while Tricks of the Trade provides new rules for Spellsongs, Scores and Metamusic feats. Power Performanaces broadens the bardic music ability even further, opening up a large number of new art forms and styles for a bard to pursue. Finally, Survival Tactics covers how best to build a bard character for a number of different roles.